The end of the year is a good time to reflect on the year past and gear up for next year. 2012 was my year to master fish. 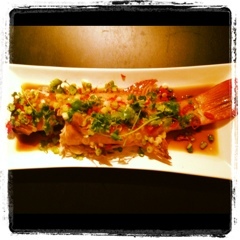 I wouldn't say I am quite a master but I do have coral trout, scallops, bugs, salmon, snapper and whiting under my belt. I am no longer fearful of the fishys. 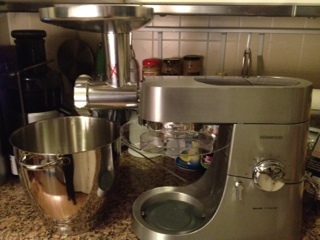 This year I received my amazing Kenwood mixer. We experimented with sausages and now have a few sizzlers up our sleeves for summer BBQs. I tried some great desserts in the Sweet Adventures Blog Hop, attended my first pop up restaurant hosted by Kylie, Audra and Mindy of Masterchef fame, learnt and feasted during an amazing trip to Adelaide for Eat Drink Blog 2012 and discovered some new favourite recipes from my wonderful collection of magazines and books on our new food bookshelf! We are now set up for great success in 2013. Armed with the Kenwood and some great new cool books from Jamie Oliver, Andy Allen and Gordon Ramsay we are heading well equipped into 2013. What will 2013 bring? MasterChef Pros is just around the corner to keep me occupied! Health kick, at least in Jan, more fresh produce to cook with and in winter I am going to augment my soup repertoire with M(i)sch(i)ef soup kitchen with an attempt to post some recipes! So, with that, let's crack open the champers, clink your glasses! Happy New Year and here's to 2013! MasterChef Professional: Being a Winner!